Tag line: "He was 98 lbs. of solid nerd until he became..."
Though founded by Lloyd Kaufman and Michael Herz in 1974, it wasn’t until 10 years later that New York-based Troma Entertainment had their first smash hit. 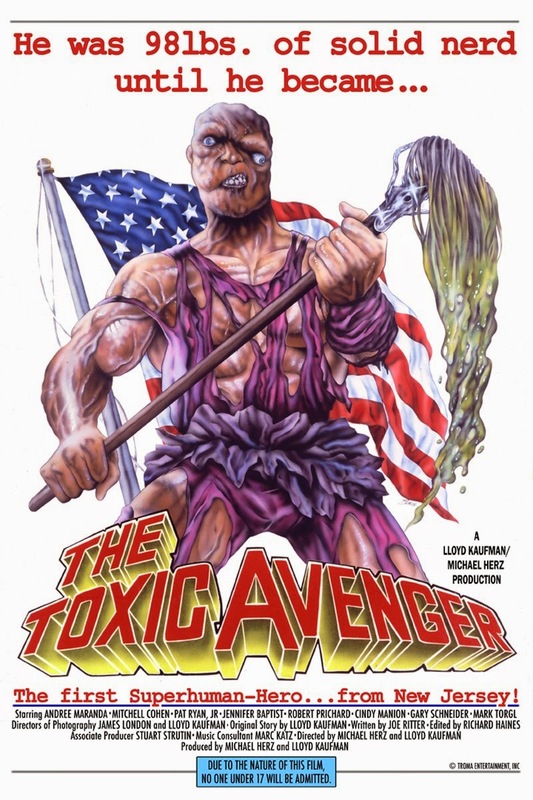 A horror / comedy produced on a shoestring budget, The Toxic Avenger wowed audiences during its run on the midnight circuit, and has since become a cult classic. The setting is Tromaville, the "Toxic Waste Capital of the World". Melvin (Mark Torgl), a 98-pound nerd, works as a janitor at a local health club, where he’s continually picked on and ridiculed by the clientele. In an effort to humiliate him, club regulars Bozo (Gary Schnieder), Slug (Robert Prichard), Wanda (Jennifer Babbist) and Julie (Cindy Manion) go so far as to trick Melvin into kissing a sheep while wearing a pink tutu. To escape the embarrassment this caused him, Melvin leaps from a second story window, landing directly in a barrel of toxic waste. But instead of killing him, the waste transforms Melvin into a mutated muscleman with superhuman strength. Now known as the Toxic Avenger (Mitch Cohen), Melvin actually lands himself a girlfriend, a pretty blind gal named Sara (Andree Maranda). What’s more, Toxie (the name lovingly given to him by the locals) becomes the area’s first superhero, stamping out crime in his effort to make Tromaville a safer place to live. This doesn’t sit well with Mayor Belgoody (Pat Ryan Jr.), the town’s head honcho and a big-time drug dealer whose business has declined ever since The Toxic Avenger hit the scene. Can Toxie clean up Tromaville, or will the bad guys win out in the end? Troma’s movies have never been known for their subtlety, and true to form, The Toxic Avenger is chock full of over-the-top sequences that feature plenty of gooey, greasy graphic violence. We learn early on just how psychopathic Bozo and his crew are when they hop into a car and make a game out of running down pedestrians, with each new kill worth a certain number of points (a la Roger Corman’s Death Race 2000). The first person they encounter is a teen riding a bike (played by D.J. Calvitto). When Bozo doesn’t kill him with the initial hit, he backs the car up and runs over the poor kid’s head, which is immediately flattened. Like its characters, The Toxic Avenger revels in the bloodshed, and thanks to some surprisingly good special effects, the violence is often stomach-churning (we actually see the biker’s brains squirt out onto the road). While I’ll always be partial to Troma’s The Class of Nuke ‘em High, which was a cable favorite of mine back in the day, it was The Toxic Avenger that put the company on the map. If you’re looking to take a trip through Tromaville, The Toxic Avenger is where your journey should begin.